This level has medium difficulty. 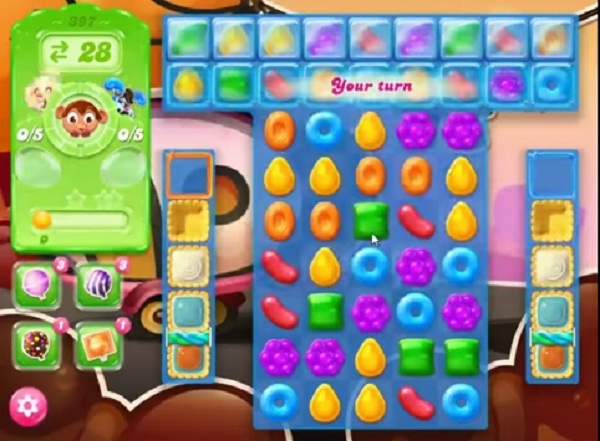 For this level try from bottom part of the board where more candies are available to play. Make striped candy and combine them with other special candy to break the blockers or to move candies to get the chance to get Monklings. After play near to Monklings or use special candy to move them and to get them out from the board. Level 397 is now 6 May nklings in 20 moves. Played it dozens of times and most I had was 4 monologues ngs. Basically an impossible level now. Sorry for typos from auto fill. It is now 6 monklings in 20 moves. Basically an impossible level.